05 Apr What are the main differences between Act 20 and Act 22? First of all, these tax incentives are very different and considers 2 separate groups of beneficiaries. The Act 20 has been created to provide tax incentives to an entity or a Corporation. This tax incentive provides such organization a 4% tax rate on net income, in addition its shareholders who become Puerto Rican Residents will be granted a 100% tax exemption on dividends paid. In the other hand, the Act 22 was created for those investors who’s sources of income are capital gains, dividend payments, and interest income. Those who are willing to move and become P.R. 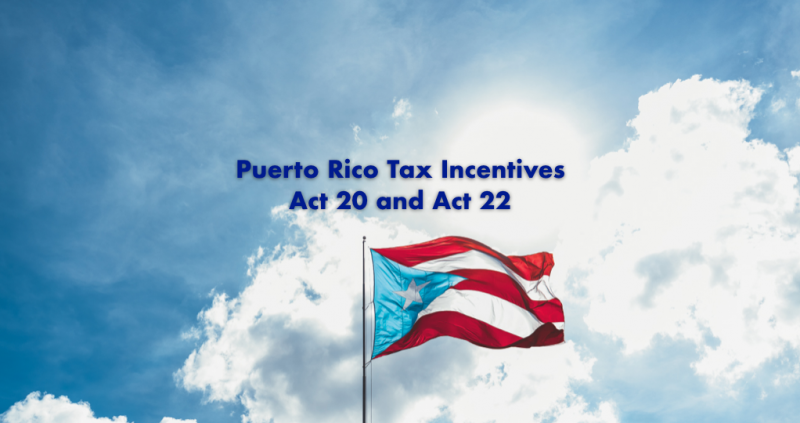 residents, once their Act 22 tax grant get approval, will be granted a 100% tax exemption on those Puerto Rico sources of income mentioned above. If you need more information, don’t hesitate and give us a call right away. Our phone number is 787-473-8985. Or reach out to our [email protected].